From the opening credits, with the sky raining blood, Tim Burton and Johnny Depp go for the jugular in this perfectly demented adaptation of Stephen Sondheim’s bizarre musical of the macabre. Back in the late 1700s there really was a Sweeney Todd. He was a barber. And he was a demon. If historical accounts are to be believed, a drunken customer, his story of having received certain favors from a woman the night before, and Sweeney’s jealous mind assuming the man was talking about his wife, led to a throat slit from ear to ear. The records indicate another 159 victims would follow before Sweeney met the gallows in 1801. During the next 200 years, embellishments, interpretations and reinterpretations would serve to establish the barber as one of London’s grisliest characters, right up there with Jack the Ripper. Yes. Sweeney Todd: The Demon Barber of Fleet Street is a musical and it is about a barber. This take on Sweeney, though, turns the original Sweeney’s wild, insane imagination into a story of more understandable, if not entirely justifiable, rage. In this case, he’s unlawfully sent off to prison by a jealous judge who lusted after Sweeney’s domestic bliss: his beautiful wife and his equally beautiful daughter. Well, not Sweeney’s domestic bliss. That life belonged to one Benjamin Barker, a highly successful upstart in the barber business whose life was lived in full, brilliant color. Returning to London 15 years later, things are grim. It’s a dark, dark world, nearly black-and-white in fact. In search of a new start and ice-cold revenge, Barker assumes a new identity as Sweeney Todd and returns to the dusty, dirty scene of his early glory days. His ultimate goal is to bring that nasty judge to his own brand of steely justice. Sweeney’s neighbor and new-found confidante is Mrs. Lovett, a down-and-out entrepreneur who admittedly makes the worst meat pies in all of London. There’s nothing like synergy and a good, old-fashioned win-win situation, even in the miserable business environs of coal-clouded London. Sweeney’s got bodies in need of disposal. Mrs. Lovett needs fresh meat. A few points need to be made excruciatingly clear. Johnny Depp (as Sweeney) and Helena Bonham Carter (as Mrs. Lovett) do sing. But for those keeping score at home, this should really come as no surprise at all. Only two years ago Depp, Bonham Carter and director Tim Burton collaborated on the delightfully quirky animated musical The Corpse Bride. Given that show’s death-obsessed storyline, it could easily be considered a dry run for the creative trio’s live-action take on Sweeney Todd. Depp and Bonham Carter do their characters justice. Depp’s Sweeney, with his nappy hair and pale face, is reminiscent of another Depp/Burton character fond of sharp edges, Edward Scissorhands. Bonham Carter’s Mrs. Lovett is more subdued; she’s not the boisterous, domineering character of the stage show, but rather a fiendishly underplayed manipulator. As for this musical about coiffures, cutlery, and yummy meat pies, it’s based on a play by Christopher Bond that was adapted into a Broadway musical by Stephen Sondheim in 1979. The movie’s screenplay gets some nice finessing and fine tuning by John Logan, who wrote The Aviator and co-wrote Gladiator. Sondheim is not like Andrew Lloyd Webber and this show is not like The Phantom of the Opera. That’s not to be taken as complimentary or insulting; it’s simply a frame of reference. A Sondheim musical doesn’t particularly lend itself to the humming of songs as one leaves the theater, but his work most certainly does make an impression. Putting things in a little more perspective, the most famous song in Sondheim’s entire catalog is, arguably, Send in the Clowns. Sondheim, in some respects, has more in common with Shakespeare than his modern-day musical colleagues. For one thing, he’s not everybody’s cup of tea. For another, it can take some time to adjust to Sondheim’s unique timbre and gait. But making that adjustment does reap rewards. Not exactly coincidentally, Sondheim has commented that Sweeney is a character who has a lot in common with Hamlet. Both destroy themselves by their hunger for revenge, albeit in far different ways. As far as musicals go, they don’t get any bloodier than Sweeney Todd, especially this cinematic version which fully exploits the medium and its capacity for special effects and visual extravagance. When the barber goes in for the kill, the blood flows, gushes, and splatters like the maddest of slasher flicks. The twisted beauty of Sweeney lends itself to film quite readily. 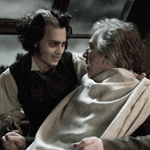 The biggest cinematic sacrifice here is that The Ballad of Sweeney Todd gets… cut. Well, the lyrics do, but the music still serves as Sweeney’s theme. It’s a sensible solution given the song would be disruptive to Logan’s cinema-friendly narrative. Amidst the blood, there’s plenty of fun — and funny moments. Among them is a marvelous rendition of By the Sea, a flash-forward type of sequence that returns to full, glorious color as Mrs. Lovett drags the moribund Sweeney into her fantasy of excess. A duet between Judge Turpin (Alan Rickman, the Harry Potter series) and Sweeney, entitled Pretty Women, plays off the musical cues and strokes of the blade with devilish glee. There’s also an over-the-top “shave off” between Sweeney and a street side barber of kings named Pirelli (Sacha Baron Cohen, Borat). That little contest becomes Sweeney’s claim to fame, a way to quickly gain a reputation as a master barber in the neighborhood and build a clientele of unsuspecting… meat. Other hallmarks of the stage production retain their punch, and perhaps get a little something extra in the transition. Johanna, the show’s recurring love song, becomes even more haunting thanks to the film’s staging. And, of course, there’s A Little Priest, which this time around is less over-the-top, but as perverse as ever. Taking Sondheim into the mainstream is no easy task, but Burton and his gang of frequent collaborators have chosen wisely, turning Sweeney’s murderous rampage into the holiday season’s most subversive treat.